When parents marry new spouses, blended families are created. These types of families are typically comprised of an adult couple and their kids from previous marriages or relationships, as well as any children they may have together. In the modern age, when divorce and second marriages occur regularly, blended families are very common and feature their own brand of challenges alongside family issues that occur in traditional families. 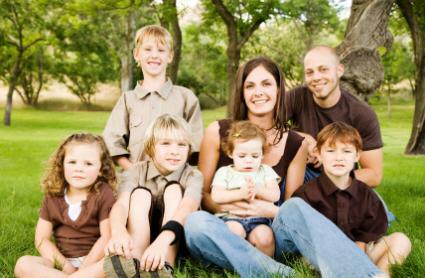 Many blended families run into issues when it comes to different discipline styles. One parent may be laid back and lenient, while the other one is very strict. For example, the husband may be flexible when it comes to his kids' curfews, and the mother imposes a non-negotiable 11 PM curfew on weekend evenings. With younger children, the discipline issue can be even more of a challenge. One parent may believe in time outs, while the other thinks that spanking is the best punishment. When one of the parents is out of the home, the other one is in charge, so when discipline styles don't mesh, the children may suffer from parental inconsistency. Scheduling for a traditional family is difficult enough when children participate in numerous sports teams, school groups and other types of lessons and extracurricular activities. Throw in other-parent visits and custody schedules and you could have an organization nightmare on your hands. Besides the activities that take family members out of the home, most blended families already had certain family rituals in place before the parents remarried. For example, some families always spend Sunday lunches together, while others have set bedtime activities every evening. When blended families work together to create new family rituals, there can be confusion and disorder if plans are interrupted, and it can be difficult to get a new routine in place. Personal and family space is likely an issue for many blended families, even in an ideal situation when a family moves into a new house together. Most likely, one family moves into the other's home, which can create territorial issues for both children and adults. Other types of space issues are prevalent when there are more kids than bedrooms in a new family situation. Children and teens accustomed to having their own rooms may now have to share with their new stepbrothers or stepsisters, which can cause fights and stress. One of the bonuses of a blended family is that there are more people to get all the chores done. However, there may be issues if one parent never implemented chore responsibilities and now the kids don't want to work. If one parent assigns regular household jobs to his children, these children may feel resentful if their new step siblings don't have to do anything yet still reap the rewards of an allowance. Blended families also have to find a way to decide what the family does for entertainment. There can be conflict when it comes to choosing games, movies or television shows. If there's only one computer in the home, kids may fight over who gets to use it. Finances can be a sore spot for all types of families, but there are many potentially explosive problems that occur around money issues in a blended family. If the parents have decided to combine their bank accounts, then there could be arguments about the amount of money spent on dinners out, vacations and extras. If the money is not blended, and one parent makes significantly more than the other, then the children of the lesser-earning parent may feel slighted if his same-age step sibling got a new car for his 16th birthday, while he received a bus pass. Every family is different, so every blended family challenge must be addressed individually by the parents. The key to overcoming these types of challenges is good communication and trust. No matter what stance the parents take, they must be a united front with their children. The other major key to success in overcoming blended family issues is simply having the patience to work through all of the difficult situations that arise and taking the time to build a new, happy family. Schedule regular family fun nights and develop a family motto in order to create unity and build relationships quickly, which will help reduce the severity of any issues that arise due to becoming a blended family.